It has been recognized for almost a century that pre-eclampsia is associated with morphological renal changes. Lohlein in 1918 noticed that glomeruli in autopsy specimens from pre-eclamptic patients were enlarged and had a thickened basement membrane. The precise nature of the pathological lesion was not determined until the introduction of the electron microscope. 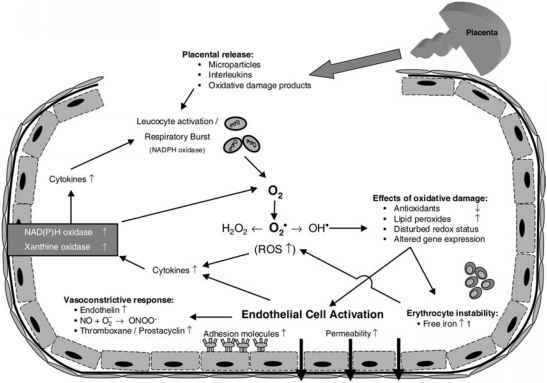 The classical pathology we now recognize to be associated with pre-eclampsia is that of endothelial vacuolization and hypertrophy of the cytoplasmic organelles classically described by Spargo et al. (1959) as ''glomerular capillary endotheliosis.'' Many original studies used biopsy specimens but there is one particularly notable post-mortem series by Sheehan and Lynch (1973). This was remarkable in that the autopsies were generally performed between 15 min and 2h following death, thus minimizing histological artefact from tissue decomposition and biopsy techniques. 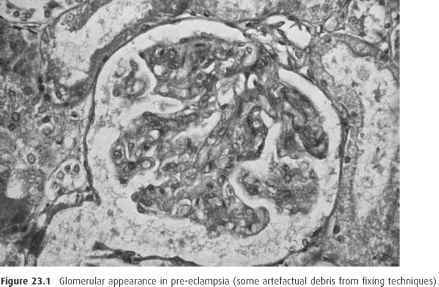 The ultrastructural renal consequences of pre-eclampsia are primarily seen in the glomerulus. The glomerulus is large and bloodless, an appearance compatible with gestational hypertension of any cause, but it is particularly marked in pre-eclamptic specimens. In pre-eclampsia the glomer-ular enlargement is seen in isolation, without any accompanying increases in the stroma or cells, distinguishing nephropathy of a pre-eclamptic origin from that associated with glomerulonephri-tis or diabetes. The glomerular tuft can be seen to contain intracapillary and mesangial cells. In the early stages of the disease this intracapillary hypercellu-larity gives the appearance of capillary dilatation or ''ballooning,'' then later in the disease the capillaries become longitudinally expanded in a characteristic ''cigar-shaped'' morphology. The increased capillary cellularity can eventually push several capillary loops into the proximal tubule — a phenomenon known as ''pouting.'' 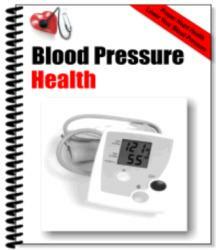 Once again, this is seen in other hypertensive situations but is accentuated in pre-eclampsia. In severe cases the mesangial cells (particularly the lysosomes) can enlarge and may further infiltrate the endo-thelial cells and basement membrane contributing to the appearance of basement membrane thickening. 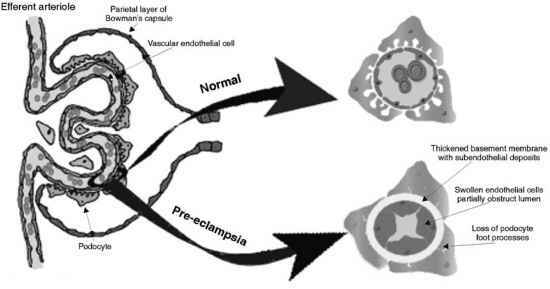 Figure 23.2 Schematic representation of glomerular changes in pre-eclampsia. the glomerular filtration rate is preserved to the extent that it is, albeit much reduced compared to normal pregnancy. The pre-eclamptic renal lesion is restricted to the glomerulus although nonspecific tubular dilatation and flattening can be seen in cases with severe proteinuria. No typical histological features in renal epithelial cells or juxtaglomerular apparatus have been seen consistently in pre-eclampsia and their involvement in the renal lesion remains disputed. The pre-eclamptic renal morphology begins to resolve in the early postpartum period and studies which have examined renal tissue remote from delivery support the view that resolution is complete (Bryans, 1966; Chesley, 1980) but the duration of the recovery period remains uncertain with estimates ranging from a few weeks to 6 months (Dennis et al., 1968; Fadel et al., 1969; Furukawa et al., 1983; Oe et al., 1980; Sheehan and Lynch, 1973).